May the Fourth be with you! All geeks appreciate the punny nature of May 4th. 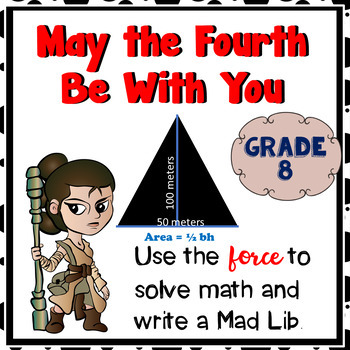 Why not combine your favorite pastimes of creating funny stories (Mad Libs), solving 8th grade math problems (yippee!) AND Star Wars? It is just too good! Let's get our geek on! This looks back at the entire year and asks a questions from 18 different objectives. Solve the problems, get your answer, and fill out your Mad Lib. Bonus: There is only one correct answer for the Mad Lib. You know instantly what questions they missed! 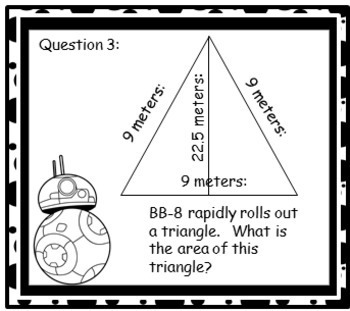 Looking for a different grade level, but same idea? 18 8th grade math task cards closely aligned to TEKS from the entire 8th grade year. 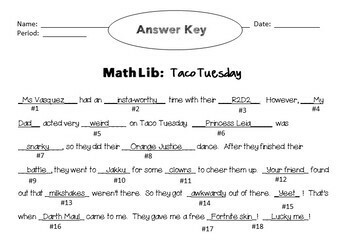 Answer keys and answer documents. This is ready to print and go. Just modify your teacher names to include in the story! Page 4 just requires a quick edit on your end. I even made you the box! 1) Extrapolation of graphed data to determine answer. 2) Solving systems of 2 equations from a word problem. 5) ranking numbers that include a radical (square root), pi, and fractions. 15) Creating a rule for dilation of an object. 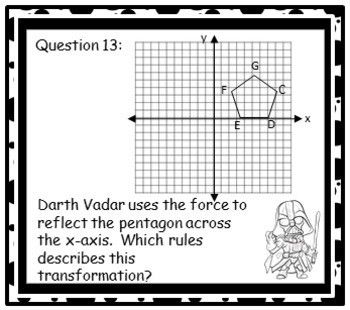 A big thanks to https://www.teacherspayteachers.com/Product/STAR-WARS-CHARACTERS-ClipArt-3710663 for the Star Wars graphics. NOTE: My license requires me to secure my documents so that the graphic artist's IP is protected. Please do not give away, sell, redistribute, post online, or repackage and sell my hard work. It takes many hours to create these items. This one took me about 12 hours. Do not post online. This particular item has no reason to be on any website, even a student password protected website.